Apple is continuing to gain a foothold in high fashion business with the latest effort a suite of new apps to be used by staff in luxury group Kering's stores across the globe. The move is the latest in Apple's enterprise efforts intended to primarily get iOS devices in the hands of big business. 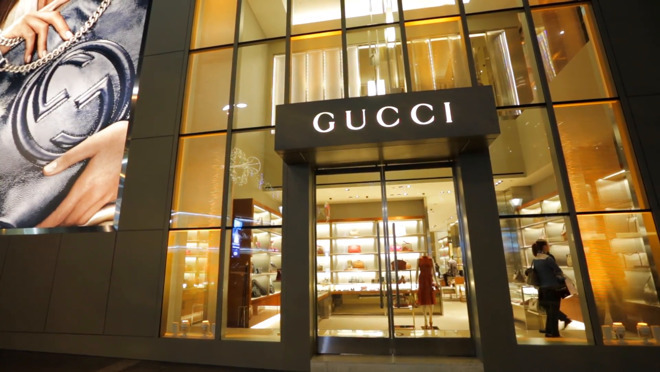 This latest project will see a series of apps deployed to a series of luxury goods stores, including Gucci, Yves Saint Laurent, Boucheron, Balenciaga, Alexander McQueen and a dozen more scattered throughout the world. The Reuters report on Monday regarding the team-up has very little detail on the offerings, saying that the app suite would allow stores to "have more control over e-commerce activities run with Yoox Net-A-Porter." Yoox Net-A-Porter is an online fashion retailer founded in 2015 after a merger that resulted in a company with about 24 million unique visitors annually, with international warehouses in New Jersey and Tokyo. Sources within Apple not authorized to speak on behalf of the company believe the partnership is part of Mobility Partner Program. Apple's Mobility Partner Program is aimed at extending Apple's technologies into the business app marketplace. The program is bi-directional, with Apple participating with the companies in discussions and training with developers, and the companies in turn supplying feedback to Apple. Widely publicized deals with IBM, Cisco, Deloitte, and others fall under the related "MobileFirst for iOS" initiative which utilizes larger businesses to take care of iPad hardware leases, device management, security, analytics, mobile integration and on-site repairs. The Mobility Partner Program is focused on software solutions, rather than the hardware and software as a package. Apple says little more to the public about the Mobility Partner Program other than noting that the program will "empower employees and usher in a new era of productivity."